If you put a gun to my head and forced me to pick my favorite band, I’d have to go with The Beatles. (You could just ask me, though. What’s with the gun? Chill out, psycho.) I have — as far as I know — every track they ever recorded, and it’s not a stretch to say that I know all the words to every track by heart. They were just the best, and the sour-faced Grumpy McGrumpersons who complain that they were not brilliant can sit and spin for all I care. So I have always had a special smart playlist for the Fab Four. I actually include every track with the artist set to The Beatles, Paul McCartney, George Harrison, John Lennon, Wings, or — because I love him, too — Bob Dylan. (I don’t have anything against Ringo; I simply don’t have any of his solo stuff in my collection.) The playlist is named “Beatles and Bob” and it’s got well over 600 items in it. Whenever I synchronize my iPhone, iPod, or Nano, I select this playlist so that I always have the entire catalog handy. You can create a similar smart playlist for your favorite artist(s). It’s ridiculously simple. I only rarely straight-up listen to this playlist, but it’s an integral component of the “Radio David” system I use in the office all day. Because you can create playlists which use other playlists as parameters, I have a different one called B&B which includes the five songs from this playlist that I’ve heard least often. 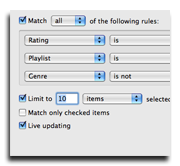 (You can also set it to choose the five tracks you’ve heard least recently if you feel that sorting by “least often played” doesn’t give you enough variety.) And then that playlist is one of the parameters I use to create my “Radio David” playlist. 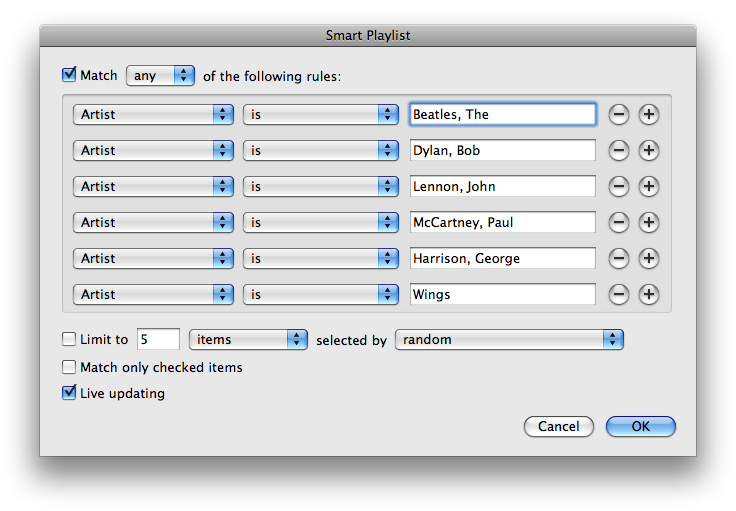 Just click the image to see how I configured my Beatles and Bob smart playlist.